Today I have used VanDyke Brown to develop some more of my details within the vines, the impressions in the trunk, and to again develop more little details. By applying small amounts of pigment, then immediately softening the edges, I can create the illusion of details and depth without actually painting every little thing. 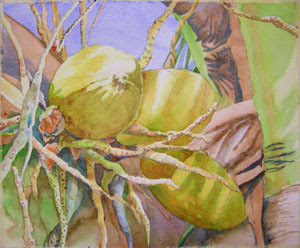 The top coconut is my focal area, so I want to create the illusion of detail without actually painting each bit in. By using this "poking" method of touching the wet pigment with a damp brush, I can create a myriad of edges that make it look detailed, without being fussy. I have glazed VanDyke Brown again within many of the shadow areas to deepen the value. Once dried completely, I glaze blues in the same manner over the browns. Using relative opposites on the color wheel creates much darker values.